We hold these truths to be self-evident, that all tracks are created to be ridden. 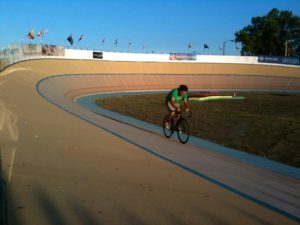 The South Chicago Velodrome is open today and tomorrow (Sat & Sun July 2, 3) from 10am until sunset (about 8:30pm). We might have the gates open Monday but don’t have a committed gatekeeper yet (stay posted). Carl is in charge leading any activities which might include the final surface repair, miscellaneous maintenance/clean-up and some riding (his discretion). Bring your bike. Every visitor is a vote for Independence as SCVA continues our journey to autonomy. Please join us in person or in spirit. Everyone’s invited to play a part in the organization or physical facility: use the facility to grow or establish your own program or join the Directors and help with establishing this new organization. If you have questions about this weekend or the ongoing effort to save the velodrome email marcus@chicagovelodrome.com or call 872-588-7282 (Luv-SCVA). To volunteer or receive ~weekly emails sign up here and if you can help staff the facility for a shift some day, here’s the scheduling form.